with love and respect at all times. Cats are one of the cleanest creatures on the earth, and spend a large part of their day washing and grooming themselves. It is not always true when people say that cats do not need human help with grooming. They still need human assistance to maintain a healthy, shiny coat to keep it in tip-top condition. All our feline friends, even the short-haired cats, should be groomed regularly. Cat Grooming removes unwanted hair, prevents hairballs and improves blood circulation, which all helps to keep your cats coat in a good and healthy condition. Your cat benefits from the groom, you and your family benefits from the groom and so does your house, as there will be less cat hair on your clothes and furniture. It is important to get your kitten used to regular grooming sessions as soon as possible. This encourages social skills for the kitten and prepares them to be tolerable of strangers grooming them. However, if your cat has grown up already and you have difficulties with grooming, professional cat groomers are here to help you! 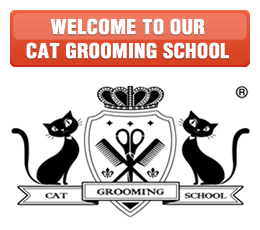 We are called Cat Grooming Specialist for a reason; we specialise in cat grooming, and understand that sometimes owners do not have enough time, skills or patience to groom their own cat. Some cats do not like to groom themselves or be groomed by someone else. That is where Cat Grooming Specialist shines in their profession. Our dedicated Cat Groomers know how to work with kittens, older cats, and even the cats that do not want to be groomed. As cats get older and less active they may become less willing to groom themselves. Cat Grooming Specialists know how to look after your ageing cat and will perform the necessary grooming techniques with all awareness on how to safely handle your cat. As life-long cat lovers we enjoy being able to work with cats and meeting their human companions. Cat grooming is a passion for us and we promise to treat your cat with love and respect at all times. Cat Grooming Specialist operates as the mobile branch of Pet Universe Cat Grooming Salon which is based in East London. "Like Us" on Facebook! 51 Atherton Road, Clayhall, Ilford, Greater London, IG5 0PQ, GB.